Discover the incredible art behind animation hits like Ice Age and Rio in this in-depth look behind the scenes at the films of award-winning 20th Century Fox animation studio—Blue Sky Studios. Over the past fifteen years, 20th Century Fox and Blue Sky Studios have revolutionized computer animation with some of the most beloved movies of all time, from their initial success with Ice Age in 2002 to hits like Robots, Rio, Dr. Seuss’ Horton Hears a Who!, Epic, and the four Ice Age sequels. For the first time, this deluxe coffee-table book tells the remarkable tale of Blue Sky’s success, from its origins as a live-action visual effects company to its partnership with 20th Century Fox and reinvention as a driving force in the world of computer-generated animation. 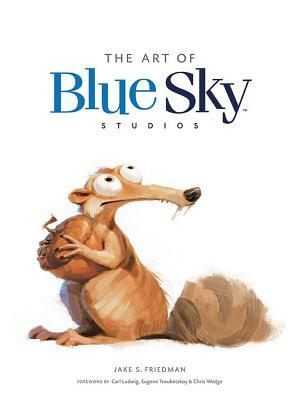 With exclusive access to Blue Sky’s archives and the exceptional artists who have made characters like Ice Age's Scrat and Rio's Blu and Jewel household names, this book takes an in-depth behind-the-scenes look at one of animation’s greatest success stories. Featuring never-before-seen concept art, early sketches, stunning stills, and other unique visuals, The Art of Blue Sky Studios delivers the complete illustrated history of this outstanding creative force in computer-generated animation. Jake S. Friedman is a New York–based writer, teacher, and artist. He is a longtime contributor to Animation Magazine and Animation Mentor, and has also written for Animation World Network, the Philadelphia Daily News, and the Huffington Post. He was an animation artist for Nickelodeon, Disney Channel, and Saturday Night Live. Currently he is an adjunct professor of art and animation at the Roy Disney Studio for Animation Studies at Mercy College in New York City and is writing the authorized biography of animation legend Art Babbitt.